Kao hedlajneri večeri dolazi nam tandem INGRAINED INSTINCTS - direktno iz Ujedinjenog Kraljevstva - od familije Sangoma. urbanom džangl legendom Zarma-om i popularnim dvojcem Dapeace-om i Mozza-om. Dotična ekipa će - 5. maja - još jednom dobrano razdrmati nexo membrane u ekskluzivnom klubu TASH MASHINE u Beogradu. 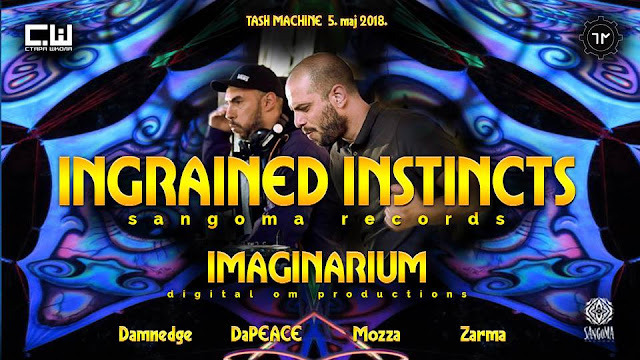 Ingrained Instincts is a unique and fresh project consisting of Tilemachos Vlachos and Dafy Deliangelos. They have shared the same passion for Psychedelic music since the very early days. They met in 2001 and formed a project together and started developing a different sound, but one totally sympathetic to the scene, and yet wholly psychedelic and funky! After many years of experimentation they created the Ingrained Instincts project. Their sound is an amalgamation of many variations, hard to categorise, definitely different and so fresh. This is one project you have to keep an ear out for, because before you know it you’ll be dancing away… Uncontrollably! It’s infectious. Tilemachos Vlachos is a musician and producer with sound design and sound synthesis studies. He is also a member of the downtempo project Escape Velocity. Dafy Deliangelos is a sound engineer and producer with music technology studies. Until recently he was involved in the Techno scene and has performed in several underground parties. Imaginarium is new born allias of Nikola Gasic,better known as Sonic Entity. Imaginarium is here to take you on a new journey into more deeper realms of Psychedelic Trance, filled with a mix of lot of old school sounds mixed together with new cutting edge production technique full of hypnotic atmospheres which will make them very explosive dance floor material!